We had 5 trees taken down a few days ago. 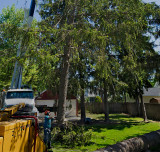 Grimshaw Tree Service of Windsor, CT did a superb job. The crew was friendly and so efficient. They arrived around 8:30 a.m. and were gone by about 1:30 p.m. They left our yard beautifully clean. It was great fun to watch them at work. They used a 40 ton heavy lift (crane), as well as other equipment. very nice report of the work operation.